A beautifully illustrated rhyming story about spring. To tell the bears, "Wake up, it's spring!" 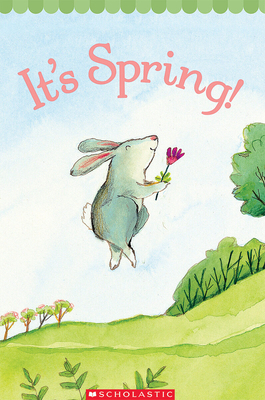 Samantha Berger and Pamela Chanko's breezy rhyming text and Melissa Sweet's charming watercolor illustrations spread the news that spring is here! This is a board book edition of a book originally published in the Hello Reader line. Samantha is the author of over seventy books for young readers, including Princess Potty and Pirate Potty. She lives in Brooklyn, where she shares her home with two terrific rescue dogs, 'Rora Mae and Polly Pocket, also know as The Senior and The Puppy. Born and raised in suburban Wyckoff, New Jersey, Melissa Sweet studied art at the Kansas City Art Institute. She has worked at various types of commercial art, and has created posters, greeting cards, and one-of-a-kind handmade books. Since entering the world of children’s books, she has published over 60 titles. Her lighthearted, gentle cartoon illustrations have graced a wide range of children’s books from board books to series fiction to more serious nonfiction subjects, all very successfully. She received a Caldecott Honor for her work in A River of Words: The Story of William Carlos Williams.